Rear motorcycle suspension or shock absorbers were invented in 1913 in the hope of minimizing or reducing the effect that rough the terrains provided. Paved roads were few and far between, rear suspension on motorcycles was designed to increase riding comfort and riding quality. So in the battle of the shocks absorbers, is it better to use a Single Suspension (Mono-shock) or Dual Suspension (Twin-shock) setup? So you want to know about Rear Motorcycle and Scooter Suspension? The first motorcycle rear suspension was called Twin-Shock. It was commonly used to describe off-road motorcycles. They would go on to play an important role in an era when motorcycle riders began meticulously calculating their rear travel and swingwarm motion. Most of the classic motorcycles with the biggest followings of all time rely on twin-shock suspension. Some race tracks will even distinguish between twin-shock (dual shock / dual suspension) and mono-shock (single shock / single suspenion) racers. 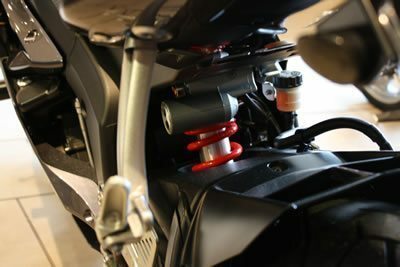 Mono-Shock motorcycle rear suspensions was created in the late 80’s and in many applications has more advanced performance than that of the twin-shocks. It utilizes a linkage to connect to the swingarm which, by and large, gets rid of the torque and will supply better handling and breaking. Single shock rear suspension requires less maintenance and adjustments. Some say that mono-shocks were created because the Long Rear Travel measurement of Twin-Shocks, were making the bikes too tall to sit on. Maybe. I’d guess that 90% of motorcycles on the road will never see a suspension upgrade. Many motorcycles won’t even have their adjustable suspension adjusted from whatever it was set to on the day they’re picked up at the dealership. Generally, motorcycle reviews will rate the suspension and will sometimes even mention the chassis design, angles, and other information. It’s good to do your research before buying. 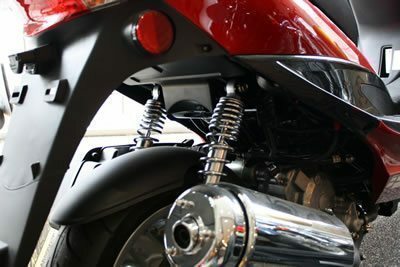 The dual shocks on my 2007 Harley-Davidson Sportster were a known weakness, but Progressive suspension can change that. Dual shock motorcycle suspension isn’t always antiquated technology compared to single shock suspension. When it comes to scooters, dual suspension will provide much better feedback and a smoother ride versus the puny single shock found on even the “luxury”, retro-styled brands of fine scooters. Fellow Italians, are you listening? Ditch the mono-shock before it ditches you! There are so many variables in rear motorcycle suspension that its difficult to give a straight answer on which of your options are better. How you use your motorcycle and how good the shocks themselves are really make all of the difference. Smooth roads need little motorcycle rear suspension adjustments or rear travel, unless you’re hauling a lot of weight. A bumpy road would give a lot of stress to most stock settings, so better rear suspension would provide a more comfortable ride and better contact with the terrain. Take a look at how much rear travel Motocross riders have to play with in order to minimize the bumpiness of the tracks. But, then again, most city roads are pretty much smooth. To each their own, happy riding! 20 years after the last Vincent Yamaha came out with the “mono shock “. Just after patent ran out. Didn’t know this. Thanks for sharing, Bill! I think it’s time to go with a mono whenever you can. Bobbers from 60 and 70 models for example will give you better handling, and lighter weight. A great alternative to hard tails especially on the east coast. 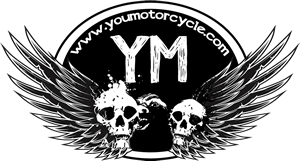 Harley did away with the Dyna, replacing with a line of soft tails, whick look like hard tails, but are soft tails cause they have mono shocks. You could look cool and even old school with the mono design. Great point. Once I get a chance to test ride some of the new Harleys in the spring I might have to give this article a brief update (it’s been a few years). Thanks Jim. I guess, as with all things, quality is what counts. Two really good shocks will be better than one equally good shock, but one really great one will be better than two good ones! Thanks for stopping in and ride safe brother! But I cant see the advantage of a mono shock over twin rear shocks for road cruising. I notice the Heritage softail has a springier rear end on potholed roads, than the Road King with its dual rear shocks. Yet all the professional advice I receive is that mono shocks are the progressive technological advancement, and that racing bikes are the cutting edge of that advancement. I argue that cruising and racing are totally different. Weight is not a factor in cruising as it is in racing, and the track is infinitely more smooth than the open road. Does anyone else agree that the Road King rear suspension is far superior to the Heritage softail? do they have the same force applied to each type of suspension system considering the position of monoshock and dualshock on the swing arm? is it safe the convert a dual shock yamaha aerox 155cc model to monoshock? Hey John. If you can find the right position to mount the single shock, I guess. But that would take a lot of engineering. The suspension also plays a huge role in how a bike handles. Unless you really know what you’re doing I’m not sure I would recommend doing that kind of swap. Why were you thinking of switching over?